I have always love sunflower! They are very attractive! The size and color are just purrfect! Big and bright yellow! For me, it is a very cheerful looking flower. It really can brighten up my days with its shiny color, and thus the cheery and jolly feeling aroused when I look at the flower! hehe. Oh, I absolutely love them! 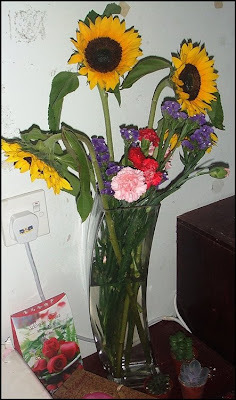 Fyi, sunflowers are one of my favourite flowers in the world! Others would be Calla Lilies, Tulips, Gerbera Daisies, Lavenders, Stargazer Lilies, and red Roses..
A secret admirer gave me this! hehee.. I was very happy when I receive it from him! Gosh..they're really beautiful and smells so nice! sape plak yg tego aku tp aku tak layan?? tak kan laa aku wat camtu... i know i'm not that mean! sape yg anda perkatakan ini? sumpah i've no idea! huhuh..